Whether your practice overlaps with tribal law, this general orientation will help Wisconsin lawyers understand the history and current status of American Indians and their tribes’ self-governance and law in the United States. In almost every constitutional law class, students spend a substantial amount of time learning about the balance of power between states and the federal government. But often the entire law school curriculum leaves out the balancing of power for unique sovereigns that predate any form of western civilization on this continent: American Indian tribes.1 For countless generations, these tribes have occupied, governed, and lived on the land that is now known as the United States. The tribes are independent entities with inherent powers of self-government. The independence of the tribes is subject to exceptionally great powers of Congress to regulate and modify the status of the tribes. The power to deal with and regulate the tribes is wholly federal; the states are excluded unless Congress delegates power to them. The federal government has a responsibility for the protection of the tribes and their properties, including protection from encroachments by the states and their citizens. The State Bar’s Indian Law Section provides a forum for both government and private attorneys with interests in the field of Indian law. The section fosters the relationship between lawyers and others involved with legal issues of concern to American Indians and tribal governments. Consider becoming a member. Section dues are $30, but membership is free to all first-year attorneys. Contact customer service at (800) 728-7788. The Indian Law Section will present “Indian law – An Introduction for Wisconsin Practitioners”on Thursday, June 25, during the State Bar Annual Meeting & Conference. Attendees will learn the areas of Indian law that are most likely to affect their practice and the resources available to deal with Indian-law related issues. Presenters will cover the principles of Indian law and the basics of tribal sovereignty. For more information and to register. For resources to tribal law, see “Engaging the Third Sovereign: The Nature, Reach, and Sources of Tribal Law,” by U.W. Law Librarian Bonnie Shucha, at page 47 in this issue. With these doctrines in mind, we provide a snapshot of the highlights to help readers gain a better understanding of this unique area of law. Federal Indian law, like many other practice areas, reflects changes in popular attitudes and governmental policy over time. Rebecca M. Webster, U.W. 2003, is an enrolled member of the Oneida Tribe of Indians of Wisconsin and is a senior staff attorney with the tribe’s Oneida Law Office, Oneida. She also is an adjunct instructor at U.W.-Oshkosh and at Northeast Wisconsin Technical College. Andrew Adams III, U.W. 2006, is a citizen of the Muscogee (Creek) Nation and member of the Tallahassee Wvkokaye Ceremonial Grounds. He is Chief Justice of the Muscogee Nation Supreme Court, Chief Justice of the Santee Sioux Nation of Nebraska Supreme Court, and a founding partner of Hogen Adams PLLC, St. Paul. David Armstrong, Northern Illinois 2007, is director of the Indian Law Office of Wisconsin Judicare Inc., Wausau, where he represents tribe members and tribes throughout Wisconsin on a variety of civil legal issues as well as code drafting and tribal systems development. The Wisconsin Tribal Judges Association website contains up-to-date information on tribal court bar admission and subject matter jurisdiction for each tribe in Wisconsin. In addition, listed below are the websites and tribal court contact information for each of Wisconsin’s 11 Indian tribes. The manner of gaining admission to the tribe’s tribal court is also noted. Bad River Tribal Court – Tribal bar exam. Forest County Potawatomi Tribal Court – Tribal bar exam. Ho-Chunk Nation Judiciary – Admission on motion with payment of fee. Lac Courte Oreilles Tribal Court – Admission on motion with payment of fee. Lac du Flambeau Tribal Court – Admission on motion with payment of fee. Menominee Tribal Court – Admission on motion with payment of fee. Oneida Tribal Judicial System – Admission on motion with payment of a fee. Red Cliff Band Tribal Court – Written and oral bar exam. St. Croix Tribal Court – Admission on motion with payment of a fee. Sokaogon Chippewa Tribal Court – Admission on motion with payment of fee. Stockbridge-Munsee Tribal Court – Tribal bar exam. N8476 Moh He Con Nuck Rd. As previously noted, P.L. 83-280 was a grant of authority from the federal government to several named state governments. It did not remove or supplant tribal jurisdiction.55 The jurisdiction of Indian tribes stems from their inherent sovereignty as periodically interpreted by the U.S. Supreme Court. Unquestionably a tribe can exercise jurisdiction over all matters arising between members on tribal lands.56 Beyond that, for civil matters the seminal case law is Montana, which created a two-part test for determining whether a tribe may properly exercise jurisdiction. To encourage judicial efficiency, the Wisconsin Supreme Court has created two mechanisms to move an active case from a circuit court to a tribal court. The first stems from Teague v. Bad River Band of Indians and requires the circuit court to hold a hearing to determine whether the circuit court or the tribal court is the proper forum in situations in which the same case has been filed in both forums. Broadly speaking, tribal courts may exercise jurisdiction over all cases involving tribe members, including family law cases involving members who do not live on the reservation, and all cases involving the tribe as a party.64 Each tribe interprets the extent of its authority differently, and a tribe might not have statutory or constitutional authority to hear all cases. It is not uncommon for contracts with tribes to contain a forum-selection clause, mandating use of the tribal court to resolve all disputes regarding or arising from the contract.65 Therefore, any lawyer representing businesses that want to do business with tribes should familiarize themselves with tribal court practice and consider admission to one or more tribal bars. Although tribal court practice may seem rarified, the subject matter is familiar to most lawyers. Every tribal court in Wisconsin hears family law matters involving their members, and the number of cases is increasing as tribes take over child support enforcement from the county child support agencies.67 Tribes may also self-insure for worker’s compensation and unemployment, requiring all tribal employees to make use of tribal forums to litigate claims that might arise.68 Tribal courts may also hear probate, real property, and juvenile matters involving both members and nonmembers. The Wisconsin Lawyer thanks photographer Scott Denny for sharing his stunning wildlife images with us. Scott is an enrolled member of the Oneida Tribe of Indians of Wisconsin. He is a self-taught photographer and has been taking photos for nearly 30 years. Starting off using a film camera, Scott transitioned to digital photography in 2006. With the Upper Midwest as his main photographic stomping ground, Scott also has photographed wildlife in South Dakota, Montana, Wyoming, Idaho, West Virginia, Pennsylvania, Florida, and Kenya, Africa. You can contact Scott at fotosforphun@new.rr.com. This is one of five gray wolves that reside at the Bay Beach Wildlife Sanctuary in Green Bay. Although appearing to be full grown, this wolf was still a pup when this image was shot. In general, wolves are far more active in the colder months (this photo was shot in November). It is not uncommon to wait several hours for moments of interesting behavior. The American icon, the Bald Eagle. Although Bald Eagle populations are now respectably high, the majority of people I encounter never seem to tire of seeing an eagle. This image was taken on a very cold January morning. As temperatures drop near or below zero, eagles become very active and that is when a photographer has to bold the cold to get those “keeper” images. If you look closely, there is frost around the eagle’s eye. After hours of standing in the cold and taking hundreds of images, every so often you get that photo you have been waiting for. These siblings are two of the five gray wolves residing at Bay Beach Wildlife Sanctuary in Green Bay. They are lighter in color and slightly smaller than the gray wolf in the cover image “Help.” Taken on a crisp February afternoon, I waited nearly three hours for the wolves to howl. Everything had to be just right – the howling, the location of the wolves, and the lighting. In most cases, a photographer is hoping for bright or slightly filtered light in order to capture the images of their subject. With wildlife, and eagles more specifically, one cannot be too choosey about the light they get. It is ice cold temperatures that keep eagles on the move and increase the chances of an in-flight image. After hours of waiting and very cold fingers and toes, the eagles began to fish. That is the golden moment photographers wait for. This article provides a glimpse of the variety and complexity within the field of Indian law. Indian people and tribal governments face challenges far different from other people and communities due to their unique historical, legal, and political relationship with the United States. Many of the lawyers who practice in the field do so due to these unique challenges and wanting to assist Indian people and tribal governments with the new and ongoing legal issues that arise. 1 See Cohen’s Handbook of Federal Indian Law § 4.01(1)(a) (Neil Jessup Newton et. al eds., 2012) [hereinafter Cohen’s Handbook]. For a brief history of tribal sovereignty, see David M. Schraver & David H. Tennant, Indian Tribal Sovereignty – Current Issues, 75 Alb. L. Rev. 133, 134-160 (2012). 2 William C. Canby Jr., American Indian Law: In a Nutshell 1-2 (Thomson West 2004) (1981). 3 See Charles J. Kappler, Indian Treaties 1778-1883 (Amereon House 1972) (1904). 5 Chief Justice John Marshall authored the decisions in the three cases: Johnson v. McIntosh, 21 U.S. 543 (1823); Cherokee Nation v. Georgia, 30 U.S. 1, 17 (1831); Worcester v. Georgia, 31 U.S. 515 (1832). 6 See William Wood, It Wasn’t an Accident: The Tribal Sovereign Immunity Story, Am. U. L. Rev. 1587, 1629-30 (2013). 7 Johnson, 21 U.S. at 595. 9 Cherokee Nation, 30 U.S. at 17. 11 Worcester, 31 U.S. at 596. 12 The concept of Congress having “plenary” power over Indian tribes originated in Cherokee Nation v. Georgia and Worcester v. Georgia, but the U.S. Supreme Court did not fully articulate this power until its decision in United States v. Kagama, 118 U.S. 375 (1886). When discussing the two earlier cases, the Supreme Court explained how the federal government was to deal with Indian tribes: “In the opinions in these cases they are spoken of as ‘wards of the nation,’ ‘pupils,’ as local dependent communities. In this spirit the United States has conducted its relations to them from its organization to this time. But, after an experience of a hundred years of the treaty-making system of government, Congress has determined upon a new departure – to govern them by acts of Congress.” Kagama, 118 U.S. at 382. 13 See, e.g., General Allotment Act, 25 U.S.C. § 331 (1887). 14 See, e.g., Oneida Indian Nation of New York v. County of Oneida, 414 U.S. 661 (1974). 15 See, e.g., General Allotment Act, 25 U.S.C. § 331 (1887). 17 Armen H. Marjian, An Unbroken Chain of Injustice: The Dawes Act, Native American Trusts, and Cobell v. Salazar, 46 Gonzaga L. Rev. 609, 618 (2011). 18 See Institute for Government Research, The Problem of Indian Administration (1928). This document is more commonly known as the Meriam Report. 19 Frank Pommersheim, Land Into Trust: An Inquiry into Law, Policy, and History, 49 Idaho L. Rev. 519, 520 (2013). 24 Cohen’s Handbook, supra note 1, § 4.04(3)(a), at 252-5. 25 H. Con. Res. 108, 83rd Cong., 1st Sess., 67 Stat. B132 (153). 26 See, e.g., 25 U.S.C. § 891 et seq. (1954). 28 Canby, supra note 2, at 26. 29 25 U.S.C. § 903 et seq. 30 Public Law No. 83-280. Wisconsin is one of six mandatory P.L. 83-280 states, along with California, Alaska, Nebraska, Minnesota, and Oregon. 31 When Congress passed P.L. 83-280, the Menominee Tribe had been terminated and not yet restored. Upon restoration of federal recognition of the Menominee Tribe, the state of Wisconsin retroceded its jurisdiction over the reservation back to the federal government. 32 P.L. No. 83-280, 18 U.S.C. §1162. 33 Cohen’s Handbook, supra note 1, § 1.07, at 99-101. 34 Indian Civil Rights Act of 1968; Indian Financing Act of 1874, 25 U.S.C. § 1451 et seq. ; Indian Self-Determination and Education Assistance Act, 25 U.S.C. § 450 et seq. Congress did not repeal P.L. 83-280, but it did put in place a mechanism by which states could request that the federal government take back all or part of its jurisdiction. 25 U.S.C. § 1323(a) (1968). In addition, if new states wanted to assume jurisdiction over tribe members on Indian reservations, they needed to obtain the consent of the Indian tribes. 25 U.S.C. § 1321(a) (1968). 35 These tribal governments receive a variety of federal benefits through the U.S. Department of the Interior. See What We Do, US Department of the Interior (Mar. 2, 2015), www.bia.gov/WhatWeDo/index.htm. 36 Michigan v. Bay Mills Indian Cmty., 134 S. Ct. 2024, 2030 (2014). 37 Merrion v. Jicarilla Apache Tribe, 455 U.S. 130, 149 (1982). 38 Aasen-Robles v. Lac Courte Oreilles Band of Lake Superior Chippewa Indians, 2003 WI App 224, ¶ 22 n.7, 267 Wis. 2d 333, 671 N.W.2d 709. 39 McClanahan v. Arizona State Tax Comm’n, 411 U.S. 164, 168 (1973) (citation omitted). 40 St. Germaine v. Chapman, 178 Wis. 2d 869, 872, 505 N.W.2d 450 (Ct. App. 1993) (internal quotation and citation omitted). 41 White Mountain Apache Tribe v. Bracker, 448 U.S 136, 142-43 (1980) (internal quotation and citations omitted). See also Teague v. Bad River Band of Lake Superior Tribe of Chippewa Indians (Teague III), 2003 WI 118, ¶ 25, 265 Wis. 2d 64, 665 N.W.2d 899 (“State circuit courts … have no authority to limit, modify or control the power of the tribal court or vice versa” (emphasis added)). 42 Teague III, 2003 WI 118, ¶ 25, 265 Wis. 2d 64. 43 California v. Cabazon Band of Mission Indians, 480 U.S. 202, 216 (1987) (citation omitted). 44 McClanahan, 411 U.S. 168. 45 Santa Clara Pueblo v. Martinez, 436 U.S. 49, 58 (1978). 46 Bay Mills Indian Cmty., 134 S. Ct at 2030. 47 Wood, supra note 6, at 1640-49. 48 See Turner v. United States, 248 U.S. 354 (1919). 49 Kiowa Tribe of Okla. v. Manufacturing Techs. Inc., 523 U.S. 751, 756 (1998). 50 Martinez, 436 U.S. at 62-63. 52 Kerr-McGee Corp. v. Navajo Tribe, 471 U.S. 195 (1985). 53 Iowa Mut. Ins. Co. v. LaPlante, 480 U.S. 9 (1987). 54 Worcester v. Georgia, 31 U.S. 515 (1832). 55 Cohen’s Handbook, supra note 1, at 344. 56 Montana v. United States, 450 U.S. 544 (1981). 58 Sanders v. Robinson, 864 F.2d 630, 632-33 (8th Cir. 1988) (applying the first Montana exception in favor of tribal jurisdiction over divorce proceedings); Aernam v. Nenno, No. 06-CV-0053C(F), 2006 WL 1644691 (W.D.N.Y. June 9, 2006). 59 Montana, 450 U.S. at 566. 60 See DISH Network Serv. L.L.C. v. Laducer, 725 F.3d 877, 884 (8th Cir. 2013) (indicating that tribal court would still have power to adjudicate when claim “arises out of and is intimately related” to the parties’ contract with tribe member related to activities on tribal land). 61 Patty Loew, Indian Nations of Wisconsin (rev. 2d ed. 2001). 63 See Teague (III), Tribal/State Protocol for the Judicial Allocation of Jurisdiction Between the Four Chippewa Tribes of Northern Wisconsin and the Tenth Judicial District of Wisconsin, Dec. 7, 2001, Wis. Stat. 801.54. 64 Cohen’s Handbook, supra note 1, § 4.02(3)(c). 65 Mark A. Jarboe, Fundamental Legal Principles Affecting Business Transactions in Indian Country, 17 Hamline L. Rev. 417 (1993-1994). 66 Wisconsin Judicare Indian Law Office, Survey of Tribal Courts, 2011. Presented to Wisconsin Access to Justice Commission. 67 The Wisconsin Tribal Judges Association website contains up-to-date information on tribal court bar admission and subject matter jurisdiction for each tribe in Wisconsin. 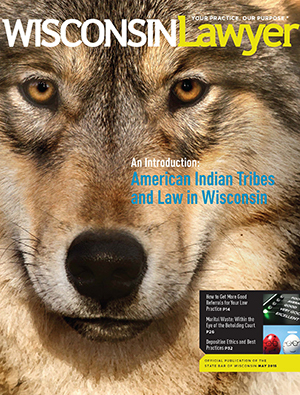 Wisconsin Tribal Judges Association, wtja.org (last visited Mar. 16, 2015). 68 Larry Betz & Donna Budnick, Labor and Employment Law and American Indian Tribes: How State and Federal Laws Apply to Tribal Employment. 83 Mich. Bar J. 16 (July 2004).